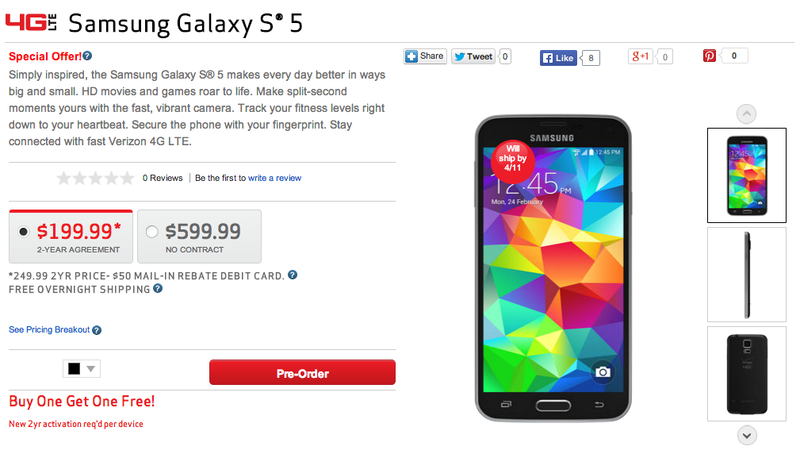 Were you waiting for Verizon to open up pre-orders for the Samsung Galaxy S5? That time has now come. For $199 on-contract (after $50 rebate) or $599 at full retail, you can pre-order Samsung’s 2014 flagship with an expected shipping date of April 11, the planned global launch date of the phone. Verizon’s version of the GS5 is like everyone else’s in that it sports a 5.1″ FHD Super AMOLED display, 16MP camera, 2,800mAh battery, Snapdragon 801 processor, 2GB RAM, fingerprint scanner, heartrate monitor, and Android 4.4 underneath a revamped TouchWiz (full specs). You can see the heartrate monitor and fingerprint scanner in action here. You’ll find a quick video tour of the phone here. And last, here is how the Galaxy S5 compares to the Galaxy S4, plus other phones. Verizon is currently only selling the 16GB model, but remember that the phone supports micro SD cards up to 128GB. You can buy the phone in either black or white. If you buy the phone now, Verizon is running a BOGO (buy one, get one free) deal just like they are with the HTC One (M8). As long as you buy the phone on-contract, they’ll hand you another phone for free (on-contract). You can choose the Galaxy S5 or HTC One (M8).